Click on this chart to find the part, accessory or pressure washer attachments you're looking for! Be sure to set-up your pressure washer outside to get started if it is a gasoline powered unit. If your unit is electric, it can be placed anywhere you need to work. Attach your pressure washer hose to your pressure washer and run this hose to the inside or outside drain you want to clean. Remove your gun/wand and attach the provided sewer jetter hoses onto the hose reel and attach the desired nozzle for the job at hand. Nozzle choices are laser or corner spray. It is wise to get one of each for most applications. Purchase a foot valves for hands-free operation when your washer is not near you. Another added option making the conversion complete is a jetter pulse valve. This attachment will make your machine cavitate as it disables one of the valves on your pump manifold (center valve suggested). This cavitation will give you enhanced cleaning power as it provides more agitation within the page. You are now ready to use your existing pressure washer as a sewer jetter and clean your drain pipes. You will always need the right part for the right job. For selecting sewer and drain jetting equipment, you can use the following charts as guidelines for selecting the appropriate equipment for your task. Please note that, while there are success stories of cleaning larger pipes with smaller machines, the figures provided in the charts are averages and represent realistic capabilities. There are variables to take into account that can and will impact the results of your jetting, such as: sewer jetting hose size and length, number of elbows and condition of the line, the power of the machine and the experience of the operator. What size drain jetter hose should I use? 2 GPM Up to 4"
3 GPM Up to 6"
4-8 GPM Up to 8"
10-12 GPM Up to 10"
15 GPM Up to 16"
18-20 GPM Up to 24"
35 GPM & greater Up to 36"
This bushing will give your 1/8" sewer hoses a 1/4" MPT working end. 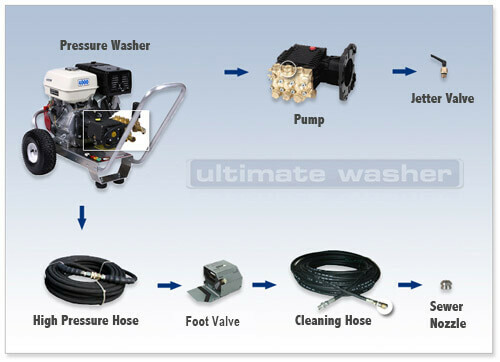 When converting your pressure washer into a sewer jetter machine, you will find the simplicity of adding a kit. While saving 25% your kit comes with nozzles, hand carry cart, and a hose reel. 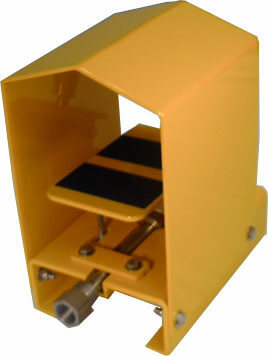 This kit is configured for a low flow - low pressure system. Kits are available in 1/8" FNPT and 1/4" FNPT versions and are drilled to your machines specific pressure and flow. Designed for the do-it-yourself person to dislodge solid or partial blockages, and to flush out loose debris such as grease, hard soap, ice, leaves, or sand. Choose pressure and flow in comments/ instructions at the shopping cart. High Pressure sewer cleaning with high flow rates requires reliable and strong hoses that will not break or tear are all important to performing where often there is an immediate response needed. The following line of sewer jetter hoses is constructed of rugged materials designed to handle the most severe and demanding conditions. Temperature ranges between -40 degrees to 160 degrees F permit good performance in diverse climates. 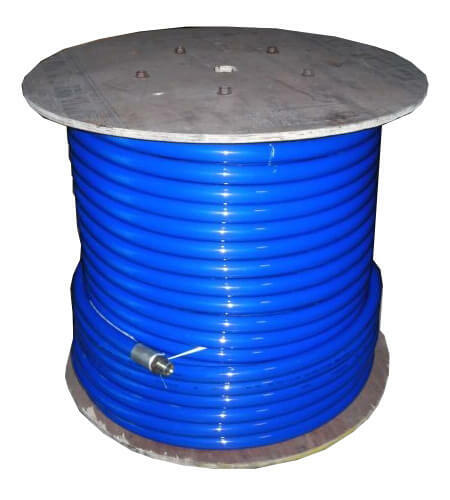 All hoses are constructed of yellow polyolefin thermoplastic and are reinforced with a high tensile synthetic fiber. Abrasion resistant polyether cover is provided for maximum strength against cuts, abrasion, or even fungus. Hoses are 100% pressure tested and assembled in the USA. 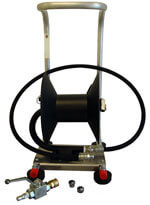 Ideal for truck and trailer mounted sewer jetters. Supported by an outstanding 6 month limited warranty. A yellow polyolefin tube, single tensile synthetic fiber braid reinforcement and abrasion resistant polyether-urethane cover. Longer lengths available on request, sizes below are standard lengths. 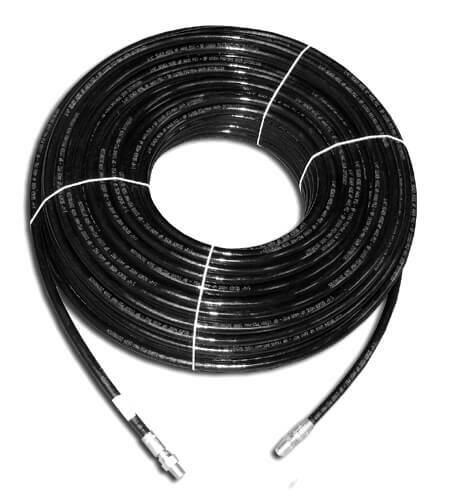 A standard high pressure hose available in 5 ID sizes, these hoses are built to provide rugged and reliable service for sewer cleaning applications. 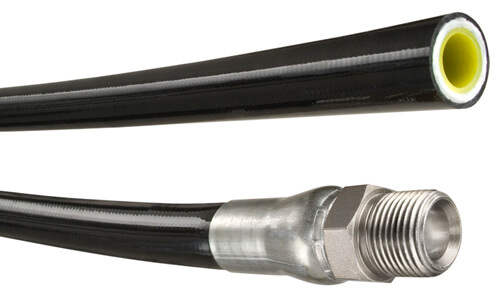 Below are lateral line or drainage line jetting hoses in 2 different ID sizes rated in various pressures. 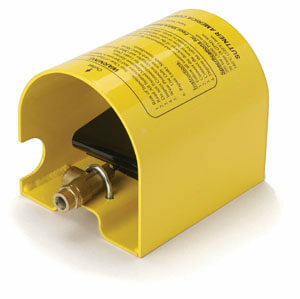 Replaces valve cap to create pulsation action, to move nozzle in pipe cleaning applications. The listed models are designed for General Pump systems. Please call toll free 866-858-4982 for pricing and availability if you have an AR, CAT, COMET or UDOR pump. Make your pressure washer into a sludge, slurry or water evacuation tool. Simply by attaching the quick-connect fitting on the sludge pump / muck scupper attachment to the end of your wand.